When Julius and Ethel Rosenberg were executed on June 19, 1953, the spy ring through which they committed espionage did not just go away. "I consider your case worse than murder...I believe your conduct in putting into the hands of the Russians the A-Bomb years before our best scientists predicted Russia would perfect the bomb has already caused, in my opinion, the Communist aggression in Korea, with the resultant casualties exceeding 50,000 and who knows but that millions more of innocent people may pay the price of your treason. Indeed, by your betrayal you undoubtedly have altered the course of history to the disadvantage of this country. No one can say that we do not live in a constant state of tension. We have evidence of your treachery all around us every day for the civil defense activities throughout the nation are preparing us for an atom bomb attack." In the book Blacklisted by History: the untold story of Senator Joe McCarthy and his fight against America's enemies, M. Stanton Evans tells us much of what happened with the Rosenberg spy ring after the Rosenbergs were gone. In the spring of 1951, ten Signal Corps officials brought charges of lax security at the Pentagon-based Signal Corps Intelligence Agency (SCIA) and alleged that "staffers of pro-Red sympathy and background had infiltrated its operations," reports Evans. The complainants added that important classified papers "had vanished from the files and never been recovered." The ten succeeded in getting some action — up to a point. The most flagrant cases were removed, but the action fell considerably short of a housecleaning. So they took their petition outside channels and went to Congress. There was a brief flurry of publicity in early 1952, but little or nothing happened. Thereafter, the ten who originally blew the whistle on the situation were told in so many words to shut up. Top officials warned them to back off and keep quiet. The ringleader of the ten, Col. O.J. Allan — Executive officer of SCIA — received a letter of reprimand accusing him of stirring up trouble by supporting a "disruptive group" and being "disloyal" to his superiors. Official channels having rebuffed them, the group sought action elsewhere. In the spring of 1953, Senator Joseph Raymond McCarthy received a "cryptic phone call [Evans' description]" from an intelligence officer with the Army who said he had some security data to share about a "hush-hush" Army research setup at Monmouth. The resulting investigations by the McCarthy committee were complex and included several subplots — one of which was the Annie Lee Moss case (see this column, Part 4). But there were others, all of which — with much new information — are thoroughly explored in Blacklisted by History. Only a few are highlighted here. Among other things, a 1952 investigation by counter-intelligence officer Captain Benjamin Sheehan had found "serious security problems at Ft. Monmouth," including — but not limited to (1) recent Signal Corps developments "appearing in the hands of the North Korean Communists" (with whom we were then in a shooting war) and (2) highly classified documents on latest U.S. defensive and offensive secrets being treated by many of the technical employees as their personal property, having these documents "indiscriminately reproduced" and "taking them home with them." Aaron Coleman, described by Stan Evans as "a poster boy for all these troubles," dealt with radar defenses and was a schoolmate of Julius Rosenberg and his co-defendant Morton Sobell. Coleman admitted having attended a Young Communist League meeting with Rosenberg and at Monmouth was among those who had a habit of taking documents home. At his closed-door committee hearing, Coleman gave evasive answers to several questions about the removal of documents from his workplace. Question: Is it your contention that you were specifically authorized to remove these documents that you had in your home? Question: Apparently the Army didn't agree with that contention, did it? Coleman: No, sir. I have the reprimand; a copy of it signed by the commanding officer which states, "You are hereby reprimanded for carelessness in custodianship, and for failure to declassify." McCarthy: The reprimand went further than that, did it not? They told you it was reprehensible on your part? The reprimand told you it was a reprehensible act and violation of the Espionage Act? McCarthy: Did it use the word reprehensible? McCarthy: Do you know that some of the secret documents are missing and have shown up in East Berlin in the Russian laboratories, and have been used by them? Are you aware of that? This column will leave it to the reader to decide whether any of us would remember being officially reprimanded for conduct deemed "reprehensible." Jack Okun, Coleman's roommate, had been suspended from Monmouth on loyalty grounds in 1949. That meant that someone whose loyalty was viewed by the authorities as suspect had access to the data brought home by Coleman. Barry Bernstein — a top science official with secret clearance — had been brought up on security charges and accused of pro-Red leanings. Nonetheless, he was reinstated and still holding down his job at Monmouth when the McCarthy hearings began. He took the Fifth Amendment when asked about his attendance at Communist Party meetings and about whether the Pentagon board that reinstated him had asked about his attendance at those meetings. Harry Hyman was employed at Monmouth until 1951, and thereafter was with a Communist-dominated union that was active among Monmouth workers. He'd been identified as a Communist by two ex-Communists. McCarthy: Were you engaged in espionage while you were working at the Signal corps? McCarthy: Have you engaged in espionage in the past several weeks? 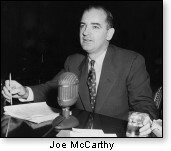 McCarthy: Did you steal radar secrets from the Signal Corps Laboratory and turn them over to Julius Rosenberg? McCarthy: Were you acquainted with members of the Julius Rosenberg spy ring? McCarthy: Were you a part of that spy ring? Another part of Hyman's testimony — this segment specifically cited in Blacklisted by History — shows him taking the Fifth Amendment as to whether he used his later capacity as a union official in an ongoing attempt to get his hands on classified information. These are mere examples. For the full story, you will find many fascinating details in Stan Evans' book. Attending the closed door committee hearings when Coleman testified in October 1953 were Army Secretary Robert Stevens and Army counsel John Adams, both of whom were to play major roles in the Army-McCarthy hearings of the following year. It is a sad commentary that the Eisenhower administration — instead of following up on the information and cleaning house — saw fit to go after the messenger. More on that later. Not long thereafter, the Army's sensitive operations at Monmouth were quietly moved out of there. Iranian nukes: thanks to unsolved spy coverup in the U.S.? What would you do differently from Obama (if you wanted to bring America down)? The Iran nukes intelligence fumble: where are the rolling heads?